MBABANE, Sep 30 2014 (IPS) - Men in blue overalls are offloading vegetables from trucks while their female counterparts dress and pack the fresh produce before storing it in a cold room. When another truck drives in, the packed items are loaded and the consignment is driven away again. Such are the daily activities at Sidemane Farm, situated a few kilometres outside the Swazi capital of Mbabane. “The farmers have a contract to supply me with baby vegetables throughout the year,” Themba Dlamini told IPS. In turn, he supplies Woolworths stores in South Africa with the vegetables, a business he said was very “sensitive”. Not only does his client demand high quality vegetables, but he has to be on time when it comes to meeting deadlines. He bought the E1.6 million business from its previous owner in 2005 and he says demand has been growing each year. “I’m competing with other suppliers from South Africa and Kenya,” he said. The contracted farmers are critical to the survival of his business because the 90-hectare land that is cultivated by the existing farmers is no longer enough. He needs more farmers to supply him. With a staff of 95, Sidemane currently exports 25 tonnes of vegetables monthly, although there is a potential to expand to 40 tonnes. But for the company to meet its growing demand, it needs to train more farmers. Lack of adequate funding was a limiting factor. 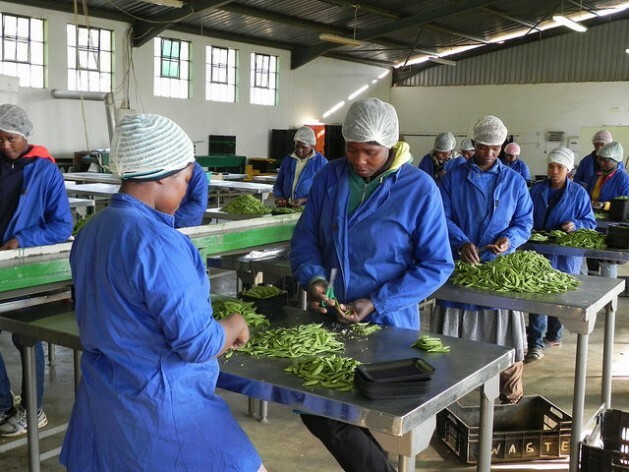 Last year, Dlamini applied and got an E380,000 grant from the European Union-funded Marketing Investment Fund (MIF), an initiative under the Swaziland Agriculture Development Programme (SADP). The Ministry of Agriculture implemented the SADP while the Food and Agriculture Organisation (FAO) of the United Nations provided technical assistance. From the MIF grant, Dlamini got a mini-truck, a generator and crates in which he packs the vegetables. The truck is very useful for transporting the vegetables and reaching out to farmers for trainings. “We experience a lot of power cuts yet we deal with perishables. The generator helps to keep the stock whenever we don’t have power,” explained Dlamini. He is one of 47 famers and agro-processors to benefit since 2012, said MIF coordinator Betina Edziwa. The project is the boost that many farmers needed to grow their businesses and improve their livelihoods. This necessitated the need to create a funding mechanism to enable beneficiaries to buy equipment and get training to help farmers sell their products. The grants were not handed out in cash, but the farmers were given the equipment and trained in business management and marketing. “Successful applicants were those working with smallholders or were involved in value-addition,” said Edziwa. This is one government and development partners’ initiative to reduce poverty and food insecurity in the country, where 63 percent of the one million population lives below the poverty line, according to the 2010 Swaziland Household Income and Expenditure Survey (SHIES). Given the high incidence of HIV/AIDS – with Swaziland leading the world at 26 percent of the productive age group – a lot of farmers took a knock. This is the injection that many Swazi farmers needed to ensure that they are able to grow from just being subsistence to commercial agriculture, said Minister of Agriculture Moses Vilakati. “The fund is in line with ministry’s approved strategy on diversification and commercialisation,” he said. Although the disbursement of funds under the MIF came to an end in June, Vilakati said the ministry will establish an agribusiness section to ensure sustainability and expansion of the initiative through follow-up training, monitoring and evaluation of the enterprises and the farmers. In a recent interview on the FAO’s website, SADP’s chief technical advisor, Nehru Essomba, said MIF is part of the broader SADP that has benefited 20,000 farmers in many other activities. One of the activities includes the rehabilitation of six dams for irrigation to support production, not only of crops but also livestock. “We’re already helping more than 20,000 famers move from subsistence agriculture to a more sustainable high income-generating and market-led agriculture,” said Essomba. It is a comprehensive approach in addressing the value chain, said EU Ambassador to Swaziland Nicola Bellomo on the same website. He said this programme links production, processing and marketing of the product, which is new in the country, a net importer. “We are trying to develop a capacity and ability to export food,” said Bellomo. And this is what Sidemane and many other famers are already doing.